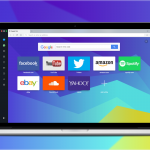 Opera 52 arrives with an improved ad blocker which provides faster page loading than on Opera 51 or Google Chrome. The latest stable version of our browser also includes a new method of selecting and copying multiple page addresses. Finally, although we hope you won’t see them often, we have some new, cool error page animations. Opera’s built-in ad blocker was implemented over two years ago, and earlier this year it added security against cryptojacking with the NoCoin Cryptocurrency Mining Protection feature. 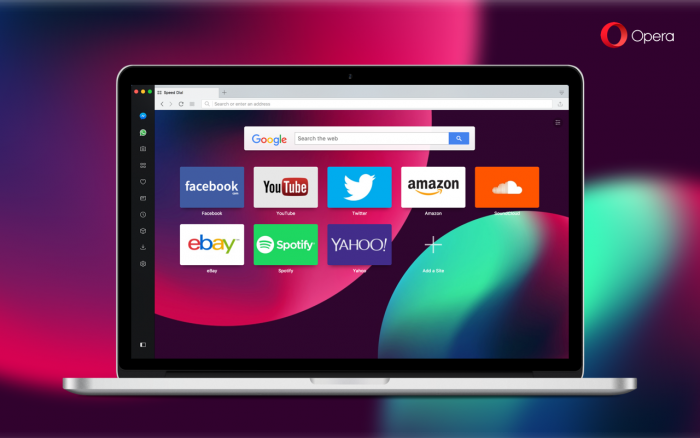 From the outset of introducing the ad blocker, Opera has stayed committed to providing the fastest, safest and most interruption-free browsing experience. In today’s update, Opera is focusing on the speed of the ad blocker. 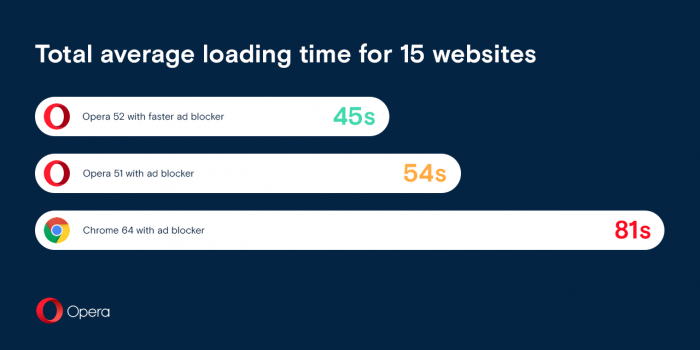 Opera 52’s ad blocker is now faster than its predecessor and outperformed the recently unveiled ad blocking contender from Google Chrome. Thanks to improved string matching algorithms, Opera’s ad blocker mechanism got increased performance gains to assist in faster page loading. To prove this, we pitted Opera 52 to a page loading speed test against Opera 51 and Chrome 64 with its ad blocker. The browsers were tasked with loading 15 popular news websites ten times each. 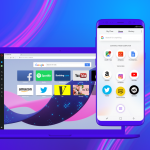 The results of this benchmark test showed that Opera 52 performs 16 percent faster than Opera 51 and 44 percent than Chrome 64. Read more about how the Chrome and Opera ad blockers compared in our benchmark tests here. Browsing with several tabs opened at one time is not uncommon for many users. 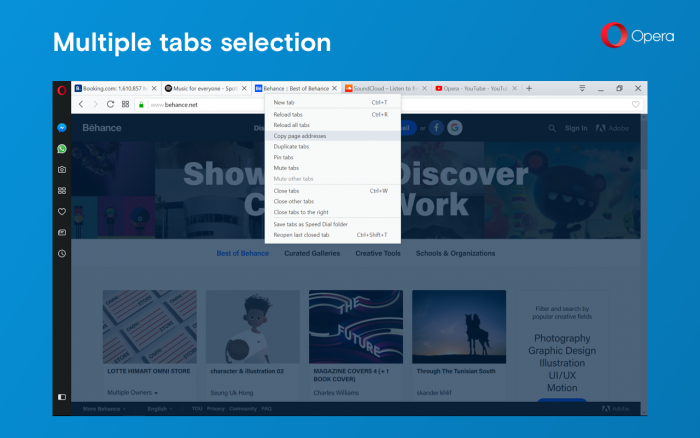 Opera 52 enhances the way users can manage their tabs, including selecting and executing actions on multiple tabs, copying multiple page addresses at once and a new keyboard shortcut for closing tabs. Users can select multiple tabs by holding down Ctrl while clicking on each desired tab (⌘ + click for macOS users). Additionally, holding down Shift and clicking on a tab will select all other tabs to its right. We think this improvement to tab manipulation will prove to be very useful. These new solutions permit users to reload, close, pin, mute or save to Speed Dial their selected tabs instead of performing the actions individually or on all tabs. When multiple tabs are selected, the context menu can be pulled up by right-clicking (or Ctrl-clicking on Mac). Moreover, rather than saving an entire browsing session as a Speed Dial folder, for example, web surfers can pluck out the tabs needed for later and save them to a new folder. A new functionality in the tabs’ context menu to note is Copy page address(es). After selecting one or multiple tabs, users can click this action to copy the web URLs of the sites to their clipboard for easy pasting later on. This is a great way to send family, friends or yourself a batch of important web pages. Finally, tabs can be closed by holding Alt while clicking it. This was previously done by holding Shift while clicking on the tab. Do let us know what you think about Opera 52! Enjoy! We tested Chrome 64.0.3282.167 (official, 64-bit) with ad blocker on, and Opera 52.0.2871.0 on Windows 10 OS build 16299.192. Each website was loaded 10 times and the loading time drawn from Navigation Timing. More details about this method can be found here. The 15 websites used in the test were bloomberg.com, cbc.ca, cbsnews.com, cnbc.com, cnn.com, forbes.com, indianexpress.com, news.com.au, news.google.com, newsnow.co.uk, nypost.com, theguardian.com, thehill.com, wunderground.com, reddit.com. The tests were conducted repeatedly on February 21st.